If you're not sure about how electric vehicles can perform, you may want to check out the BMW i8. These cars have 369 horsepower and can accelerate to 60 miles per hour in less than five seconds. 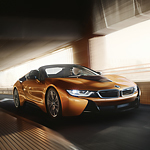 There are two versions of the i8 that we have at BMW of Portland: the coupe and the roadster. The BMW i8 has a pair of power sources. The standard engine is a 1.5L TwinPower Turbo with three cylinders, and the electric motor is powered by a lithium-ion battery. That battery can be charged at home or on the road at a charging station. It can be fully charged in only three hours. BMW is no stranger to luxury, and it shows in the i8. Heated, leather seats are standard, and they can come in Ivory White or Black. The Carbon Fiber interior trim is sleek and stylish.